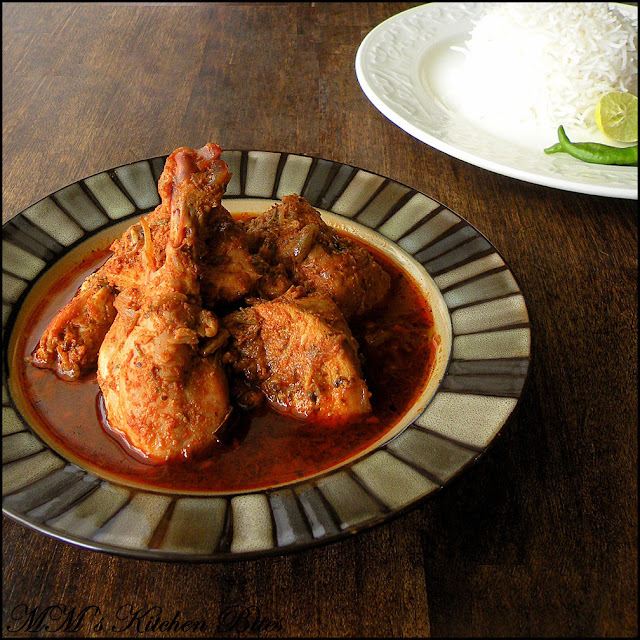 MM's Kitchen Bites: Murgh Saunf Kasoori...mix 'n' match!! Mix in lemon juice/vinegar, salt, turmeric, red chili powder and oil in a non reactive bowl. Add the chicken pieces and rub the marinade well over the chicken pieces. Cover the bowl and let the chicken marinate for an hour or so. Start with the curry: heat oil/ghee in a pressure cooker (or a heavy bottomed pan). Add bay leaf, cumin seeds and lightly crushed green cardamoms, cloves and cinnamon. When the spices start sizzling, add in the onions. Cook the onions till they start turning light golden brown. Add in garlic paste, ginger paste, fennel seeds and mix well. When onions get all fried and nicely browned, add tomato puree, both kind of chili powders, coriander powder and fry till the oil separates. Add the marinated chicken and kasoori methi. Stir and mix so that the masala coats the chicken. Let it cook on all sides for about 7-8 minutes till the chicken starts to brown. Add about a cup of water and stir. Open the lid and check on the consistency of the curry. If it’s too thin (as the chicken would have released some water as well as oil/fat), increase the heat and dry it up a bit. Keep the chicken covered till serving time. Serve with some steamed rice or bread of your choice. hey i never seen this recipe before and cooking chicken in different way and variety of aroma spices its awesome yar... i going to taste it.